A couple years ago Netflix revived the brand with a new computer-animated Care Bears series called Care Bears & Cousins, and recently season 2 of this show was released on DVD. Titled Care Bears & Cousins: BFFs, it contains the six episodes from the second season. Yes, there are only six episodes in a season, and while that doesn't sound like much it still adds up to about 2 hours and 15 minutes worth of content on the DVD. That's not bad for only $10. I've never seen this new series until watching this DVD, but I did see the original show back in the 80s when my sister used to watch it. It's been quite a long time so maybe I'm remembering wrong, but it seems like this new show is geared for a younger audience than the original. The plots are very simple and there isn't much character development, so as an adult with no children I couldn't really get invested in either the stories or the characters, but I do think younger kids would enjoy it. The artwork isn't bad, certainly better than Micky Mouse's Clubhouse, and it's colorful, has good voice acting, friendly characters, and there are lessons learned in each episode. The characters don't seem to use their belly badge powers very often, which seems like kind of a waste since that's one of the main recognizable aspects of these characters. Without those they would just be colorful teddy bears, so why not put them to use more? I think introducing a more fearsome antagonist would also be helpful. Beastly is really a bit mild and seems only a little less grumpy than Grumpy Bear. That's my two cents for a show that was clearly not made for an adult male with no children, so take it with a grain of salt. The lovable Care Bears™ and their kindhearted cousins return for more adventures in Care Bears & Cousins: BFFs – Volume 2, arriving on DVD and Digital HD March 7 from Lionsgate. Consisting of six episodes from the all-new series, this installment follows the Care Bears as they teach children important lessons through their exciting journeys in the magical land of Care-a-Lot. 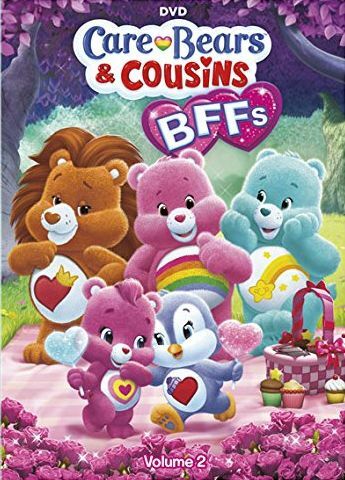 With hours of adorable entertainment, the Care Bears & Cousins: BFFs – Volume 2 DVD will be available for the suggested retail price of $14.98. Join the Care Bears in Care-a-Lot where friendship is in full bloom! The Care Bears and their Cousins discover that best friends are forever in these sweet and smile-raising adventures. Whether they’re trying to help Brave Heart have the awesomest day ever, caring for an injured Grumpy or learning valuable lessons about jealousy and the importance of keeping promises, the Care Bears and their Cousins fill every moment with caring, sharing and fun! Care Bears™ and related trademarks © 2017 Those Characters From Cleveland, Inc. Used under license by Lions Gate Entertainment, Inc. American Greetings with rose logo is a trademark of AGC, LLC.